So you think you can’t drum? 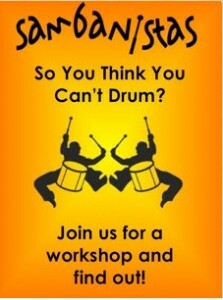 Wondering if samba drumming is for you? Come along, give it a go and find out. No experience is necessary, just a willingness to have fun and not take it – or yourself – too seriously. 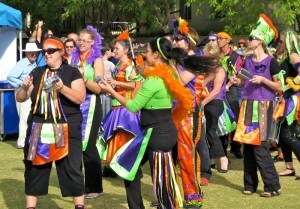 First visit: occasionally we run beginner workshops that will give you an excellent introduction to the basics of samba. If you can’t wait for our training workshop, you’re welcome to come along to any rehearsal to check things out. Please call our samba mobile prior (0466 426 740) or drop an email to enquiriesandbookings@sambanistas.com for further info. Usual rehearsal: Every Sunday 12:00-2:00pm at Perth City Farm in East Perth (behind the roller door). There is a lot going on in our rehearsals, so don’t expect to pick it all up in one go – no-one ever has! Generally the first hour will be devoted to intensively learning or practicing one rhythm, and in the second hour we will play everything that we know – this is the part where you think ‘I have no idea what’s going on!’ Relax, enjoy the music and go with the flow. As you come back each week you will get more familiar with the music and will be taught each rhythm in turn. After a few weeks you’ll know what’s going on, although it takes most people about three months to feel truly confident with the whole range of music that we play. Once you have mastered a basic level of competence playing one instrument, you will be invited to perform with us at upcoming gigs. This may sound nerve-wracking, but it’s actually heaps of fun and like many things in life, you never forget your first one! Sambanistas is a community group. Sambanistas value their right to learn in a friendly, creative and comfortable environment, unhindered by the unacceptable and/or inappropriate behaviour of fellow Sambanistas. The manners and laws of real life apply and you may be asked to leave if you breach the standards below. We welcome people of all ages, races, religions, genders, national origins, level of ability, sexual orientations and points of view. We do not tolerate expressions of bigotry, hatred, harassment or abuse. We do not tolerate threatening, defamatory, abusive, tasteless or offensive statements or sexual innuendo. The Sambanistas encourage children to participate in all rehearsals, workshops and performances, however parents/appointed guardians must be responsible for their children at all times. Harassment – sexual, verbal, written, physical or implied innuendos. Sexually explicit and coarse language. Racial, religious or sexual discrimination or bias. Sambanistas is great fun and acting responsibly will ensure it remains fun for everyone. This must be agreed to and signed by all members.